This was the fourth wine of the tasting evening, which may have included a bit of palate fatigue but we all agreed it was the nicest. The 2015 Bordeaux vintage shows its excellence here. Medium to dark black in the glass. Cassis, black berry coulis and some gaminess. On the palate it reeks of Bordeaux- cassis, dark berries, oak and grippy tannins. The mid palate is where the astringency kicks in with a black tea component and some decent blackberry jam notes. The finish is totally dry. Short length on the flavors but the tannins are in full force. 90 points and 4 stars for this $45 wine. Drink till 2027. Salut…. Very pale yellow, probably the lightest colored wine I have ever seen. The nose has pineapple, quince, peach and nectarines. On the palate it is enticing- mainly peaches to begin with. There’s a petroleum note that typifies the varietal alongside some yellow apples. Super tasty mind you, with some focused acidity to keep things sharp. The midpalate has some enjoyable flab, a weightiness that fills the mouth and adds to the body. The finish gets all serious with some flinty minerality, a resurgence of the apple theme as well as the nectarines and is medium in length and smooth. Overall this is a terrific wine that gets 92 points from me. Drink till 2025. $45 is rather steep, but this one’s a keeper that gets 4 stars. Salut…. One of the lightest, most clear wines I have ever seen. On the nose- strawberry, violets, maraschino cherry and a faint touch of oak. On the palate it is lithe, smooth, tasty and well balanced. Strawberries and rhubarb hit me. The mid palate is so smooth and brimming with red fruits. The tannins are quite present for a Pinot, I am enjoying them immensely. The dryness continues on the medium to long finish which has more strawberry. 92 points for this very seductive wine made by Eola Hills that gets 5 stars. $45 at the cellar door. Drink till 2025 with roast Cornish hens, NY Strip or some cheese and crackers. Salut…. Very pale and see through, just like a Pinot. On the nose I get crushed cherry, strawberry and slate. Kinda like Pinot! On the palate it’s different, much more brooding than lets on. The flavor profile is more strawberry but I get a dark fruit note as well. Tannins are grippy and give the wine a juicy mouthfeel. The finish is generous with dark fruits coming through on its medium length. This wine needs a bit of time, 2019-2027. It gets 91 points from me and for the $45 list price- a 4 star effort. Salut…. I really loved the 2010 Campogiovanni when I drank it last year. So much so that I bought six bottles of the 2012 on spec. It got great ratings (96 WS), was priced right at $45 and delivered free. This one shows a slight orange tinge when I poured it, which is unusual for such a young wine. The nose is cherry, earthy funk, mushroom, oak and a trace of truffle. On the palate it shows primal fruit flavors of cherry, leather, gorgeous tannins and a juiciness from the impeccably balanced acidity. The tannins deserve a sentence of their own- fine grained, discrete at the beginning, working themselves squarely into the mid palate and reaching a crescendo on the finish. Not mouth puckering, but certainly apparent, very lithe yet powerful. They hold the wine together nicely. The finish has an oak hint to go along with the cherry and game notes. This wine is very young, and holds promise for many years of cellaring that will help it develop secondary notes, maturing into a great Brunello. I can’t wait to taste the evolution, perhaps starting in 2020. I will have to go with 93 points right now and 5 stars. Tonight’s pairing is with a Beef Pot Roast, bathed in Petite Sirah and braised for 6 hours. Salut…. I like this winery’s style. Merryvale gets the right balance of extraction and finesse. I tried to visit their tasting room last month in Napa but it was not my scene. Dark and crowded with drunks falling off the bar stools, it reminded me of the old west or Georgetown on a Friday night during my college days. I didn’t let that detract from my impressions and enjoyment of their wine though. 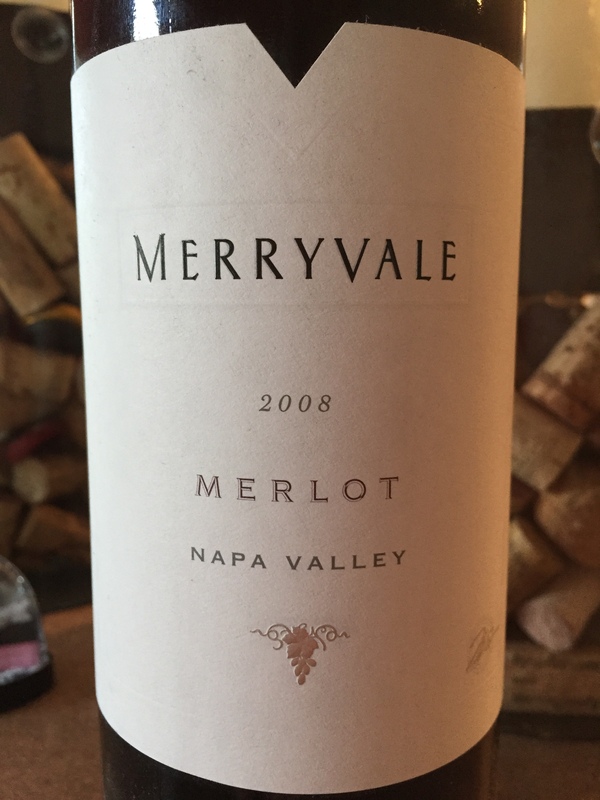 This Merlot is very dark and brooding in the glass with a nose of black currants, oregano and dried herbs. A crisp linear initial attack of currant, stewed plum and dark berry compote. Immense tannic thrust on the gums is delightful and balanced by mouth watering acidity. Wowsa. This wine has a long finish and good cellaring potential. I enjoyed it with Cajun rubbed ribeyes, a perfect combination. 2015/2022 would be a good estimate. 92 points make this $45 wine worthy of 4 stars. Salut….